An exciting project in Kinlough which will see existing sports grounds in the village transformed is now in full flow with those behind the initiative saying they are delighted with the progress being made, but adding that much more needs to be done. Appealing for financial support for the work, the Kinlough Community Project is hoping to raise €175,000 in order to complete Phase 1 of an exciting new development which will see the replacement of the pitch at Pairc na Meilge. Phase 1 will also include the erection of new ball stop netting and fencing. 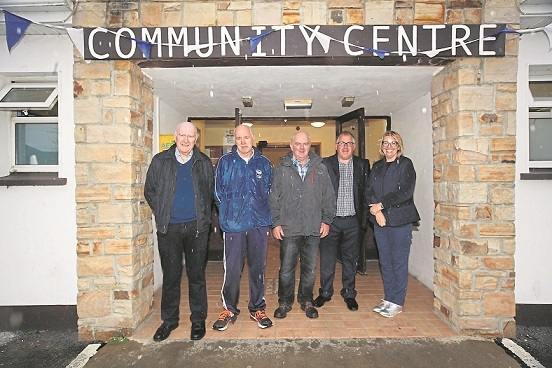 The pitch is located adjacent to the Community Centre in Kinlough and the facility has seen an explosion in use over the past number of years and there are now plans to do much more to service the community’s needs. After Phase 1, it’s planned to redevelop and extend the changing rooms at Pairc na Meilge (Phase 2) and also develop a new stand, extra changing rooms/meeting rooms and a sports hall (Phase 3). The community secured a grant for €25,500 from the Sports Capital Programme in 2017. The total cost of Phase 1 of the development project is €200,000 which means €175,000 now has to be raised. The local fundraising committee which was formed to lead the project have renewed their appeal to the local community and those living in the wider Lough Melvin area to support this major effort which on completion will be a huge boost to all who live in the area. In a unique venture, donations of €100 are being sought which will allow people to ‘make their mark’ on Pairc na Meilge. Each €100 donation will represent a square of the playing field and will offer a person the chance to record their name, or that of a loved on, along with a townland on a commemorate plaque. The full list of names will, once Phase 1 is complete, feature forever in a prominent position at the grounds. On top of that, the donation of €100 will also allow entry into a special members only draw at Easter 2019 for five prizes of €1,000. The committee are also seeking different forms of sponsorship from businesses and they are looking forward to working with local business owners on this. The fund-raising committee are deeply involved in raising the necessary funds. Pat Gallagher is chairman; Martin McCarron is secretary and treasurer is Katherine Williams, who told the Democrat that they are finding a very positive response. "We have a big group involved and it is important that we sell as many tickets as possible as some monies will be needed immediately in relation to the contract. "We hope to have a prize fund also for those contributors and we have set a date of Easter next year for that. Hopefully, the pitch will be finished by that stage and grass will be sown. "Indeed, we can see the work taking shape at the moment and that helps in our door to door selling. "Forty years ago the facility was developed with a £50 per house pledge. We know that €100 euro is a big sum, but we are prepared to give people time. "There is a great community spirit in Kinlough; it was there 40 years ago and it is still there. This development will be for future generations and it is unique in that the facility is available to all sports, schools, athletics, GAA and the FAI. "We are all pulling together and it will be worth it when completed," said Katherine.